Kin Seto, RPh grew up in Manhattan, New York. He obtained his Bachelors of Science degree in Pharmacy from The University of Mississippi and has remained in Mississippi since then. He is an avid deer hunter and loves Ole Miss football. Kin and his wife, Jeannie have lived in Columbus since 1980, where they are members of Pleasant Hill Baptist Church. Kin was responsible for opening and operating the first Dutch Pharmacy at Dutch Village in Columbus in 1990. Today, he still operates the same pharmacy, where he personally knows virtually every customer. 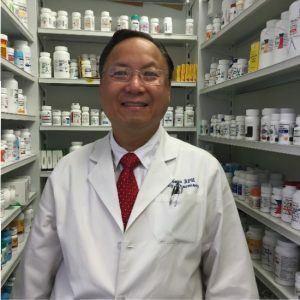 Kin is currently licensed in Mississippi and Alabama with a total of 36 years of clinical and retail experience in the pharmacy business. He also has his certification for immunizations. Drop by anytime for fast and friendly service at Dutch Village from 9 am – 7 pm. Drive Thru available. Services also include Health Screenings and Immunizations. Family Pharmacy at Dutch Village is located within the SprintMart at 1245 N Lehmberg Rd in Columbus.